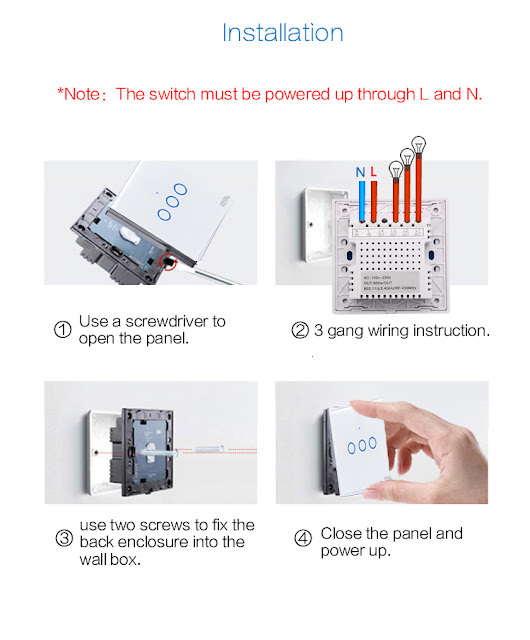 Hi, welcome to the manual of Electomotive Touch Switch 2-3 gang WiFi & RF wall switch! You can touch the switch on/off, or use App eWeLink/433MHz RF Remote to turn on/off. The switch must be powered up through L in (Live input) and N in (neutral input). While L1 out, L2 out, L3 out are live output for each gang. Power up your wall switch. Press the first button for 7 seconds until it fast blinks to enter into WiFi pairing status. The blinking way is: blink 3 times repeatedly. Maybe the device is “Offline” on eWeLink, for the device needs 1-2 minutes to connect to your router and server. When the green LED on, the device is “Online”, if eWeLink shows still “Offline”, please close eWeLink and re-open. You’ll need to pair the 3 gangs one by one. Press and hold the touch button of TOUCH SWITCH until you hear a beep sound. Press a button on RF Remote. You’ll hear a beep sound when it’s being learned successfully. Repeat above steps to pair the other gangs with the RF Remote. Press and hold the touch button of TOUCH SWITCH until you hear two beep sounds. Press any button on the RF Remote. You’ll hear a beep sound when the code is cleared successfully. One device one owner. Other people cannot add the devices that have already been added. If you want to add your device to another account, don’t forget to delete it first. Green led quickly blinks one time and repeats, which means device failed to connect to the router. The reason may be you have entered wrong WiFi password or your device is too far away from the router, which causes a weak WiFi signal. The device cannot be added to the 5G-wifi-router, only the 2.4G-wifi is OK. At last, make sure that your router is MAC-open. Green led slowly blinks one time and repeats, which means the device has connected to router and server but failed to be added to the device list. Then power on the device again, if it still not working, just add the device again. Answers: the Electomotive Touch Switch doesn’t support to be controlled by LAN. You’ll need to connect it to a WiFi with Internet.